To be honest, when I posted this photo on my IG I kind of posted it half joking. 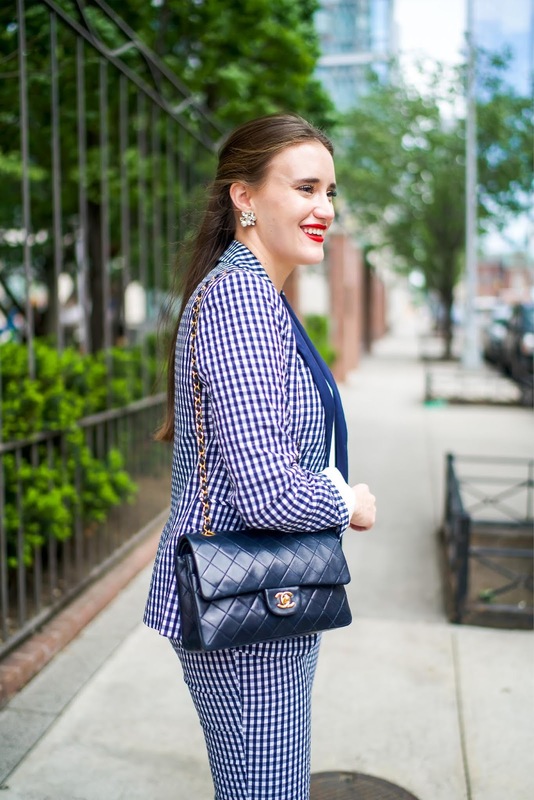 But after the response I got from you all, I decided to rock this gingham suit and turn it into a full-fledged blog post! This outfit came to be when I was trying to style THIS blog post. I was searching my closet for something to pair the pants with when I pulled out my gingham blazer and realized it matched perfectly (thank you, J. Crew). Then I asked Andrew his thoughts and it was shut down lol. I get it! It's a lot! But here we are, in full-fledged gingham. Rocking it like there is no other print available, and I kind of like it! I will admit that this blazer is a year and a half old but I knew from the moment I saw it, I had to have it! I think what I'm *most* surprised about is how something from J. Crew over a year ago and something from J. Crew factory this season are the exact same print (color and all). I don't think I wanted that to happen in my wildest dreams but I'm so glad it did! Now I just need confidence enough to rock this at work and we are on our way!